Human chorionic gonadotropin, a hormone produced by the placenta during pregnancy, gives a positive result when detected by pregnancy tests. If you are using the HCG diet as a method of weight loss, there is a chance that you could get a positive pregnancy test result even if you are not pregnant. The HCG diet involves regular injections or supplements of the HCG hormone and a severely restrictive diet. According to MayoClinic.com, the typical calorie intake for the HCG diet is between 500 to 800 calories, which is only a quarter to a half of the calories you actually need in a day. HCG signals your brain to mobilize stores of fat, which helps your body bring nutrients to the placenta during pregnancy. Although HCG injections can be prescribed for fertility treatments, they are not approved by the U.S. Food and Drug Administration as a weight loss method. 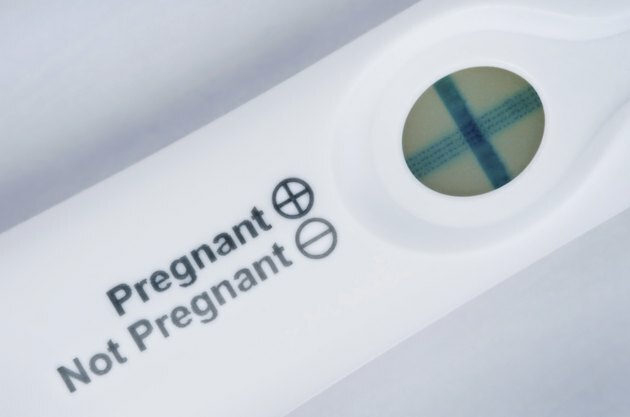 It is possible to get a positive pregnancy test if you are not really pregnant. Since pregnancy tests detect the levels of HCG in your blood or urine, you may get a positive test if you are taking a medication with HCG. However, the levels of the hormone that you receive during the HCG diet may not be enough to trigger a positive test, even if you use a sensitive test that is designed to detect HCG in small amounts. If you receive a positive pregnancy test while on the HCG diet, and there's a chance you could be pregnant, see your doctor as soon as possible and stop participating in the diet. The restrictive calorie intake could be harmful to your unborn baby. Keep in mind that the HCG diet itself is not necessarily safe, as rapid weight loss can be dangerous and can deprive your body of important nutrients. According to the February 1990 edition of the South African Medical Journal, a study at the Department of Medical Physiology and Biochemistry at the University of Stellenbosch tested the effectiveness of HCG injections on 40 obese women compared to a placebo group. The study revealed that the women who received the HCG injections did not have a weight loss advantage compared to the placebo group. If you are trying to lose weight, talk to your doctor about a method that is safer and more effective than the HCG diet. MayoClinic.com: HCG diet: Is it safe and effective?